Russian Arctic elite solders will have on their disposal a series of new armored personell carriers made for the harshest climatic conditions. 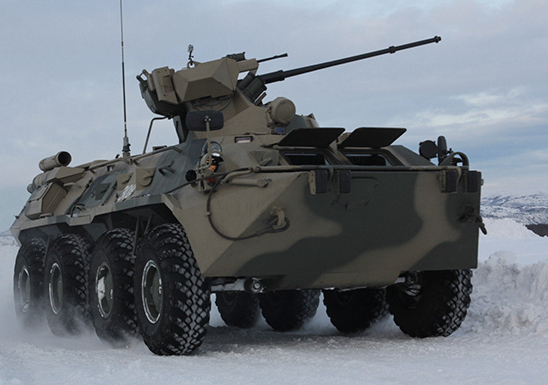 The BTR-82A vehicle will be able to operate in minus 60 degrees and 60 cm deep snow. It will be the Russian Arctic Brigade’s first combat vehicle on wheels, sources in the Russian Armed Forces inform. A total of 20 new personnel carriers of the kind are now being delivered to the Armed Forces, of which several will be included in the Arctic Brigade, a source in the Ministry of Defense tells newspaper Izvestia. The BTR-82A is a modification of Russia’s armored personnel carriers BTR-82. I will have 300 horse powers and be equipped with a 30 mm automatic gun and a 7,62 mm machine gun. In 2015, the Arctic Brigade was equipped also with new Vityaz and ТТМ-4902PS-10 belt carriers, as well as terrain vehicles AM1. The Russian Arctic Brigade has over the last year conducted a string of exercises all over the Arctic, including in the New Siberian Islands, the Taymyr Peninsula and the Novaya Zemlya. In late September this year, the Arctic elite forces trained in the Franz Josef Land and this week they again conducted training in the Novaya Zemlya, the Russian militarey press service informs.